Yesterday I got the opportunity to play the game Citadels from Fantasy Flight Games. Citadels is a kingdom building card game where each turn you get to select which role you will be playing in the kingdom as you try to build the greatest citadel. To build your citadel, each turn you may either draw cards or take gold, and then you can use your gold to build pieces of your citadel. 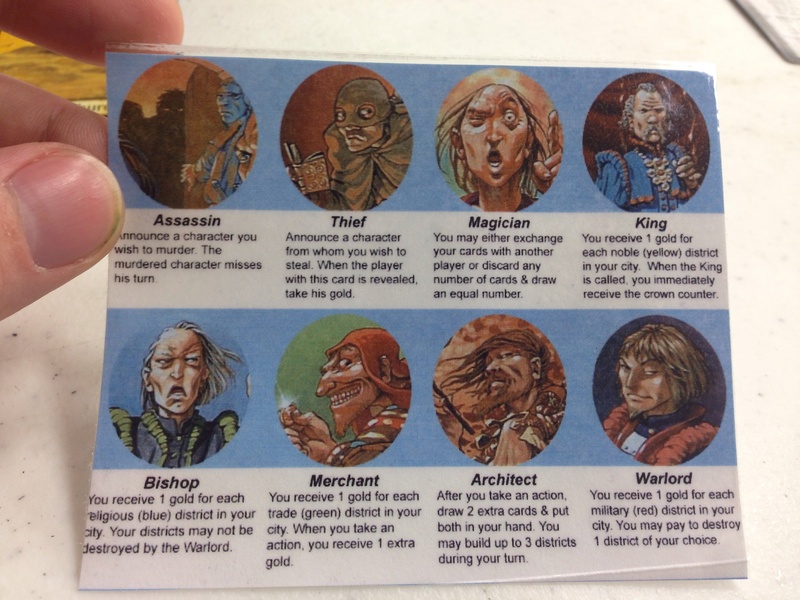 Before each turn, the players choose which role they will be playing for that turn; the roles are Assassin, Thief, Magician, King, Bishop, Merchant, Architect, and Warlord. Each of these roles then determine when each player will go in the round and what special abilities they have to help them build their citadel. To select these roles the role cards are shuffled and then one is discarded face down. The number of players then determines the number of role cards which are dealt face-up which won’t be used that round. The player who was the King the previous turn then secretly looks at the remaining role cards, chooses which they will be taking, and then passes the rest to the next player. Once all of the roles have been selected, the roles players have chosen are revealed based on the numbered order of the cards, keeping them secret until their number has been called. This secrecy is important as the Assassin chooses a role they wish to kill that turn (who then misses their entire turn) and the Thief chooses a role they wish to steal all of the gold from that turn. The other roles give the players abilities to generate more gold based off of the citadel cards they have built or abilities to obtain more cards. The end game triggers once one player has built the eighth card in their citadel; the turn finishes and players then score their citadels. Players receive points based on the gold cost each card cost to build. They also receive bonuses for being the first to reach eight cards, if they had eight cards but weren’t the first, and if they have at least one card from each of the five colors of cards. The player with the most points after this is all totalled wins!!! 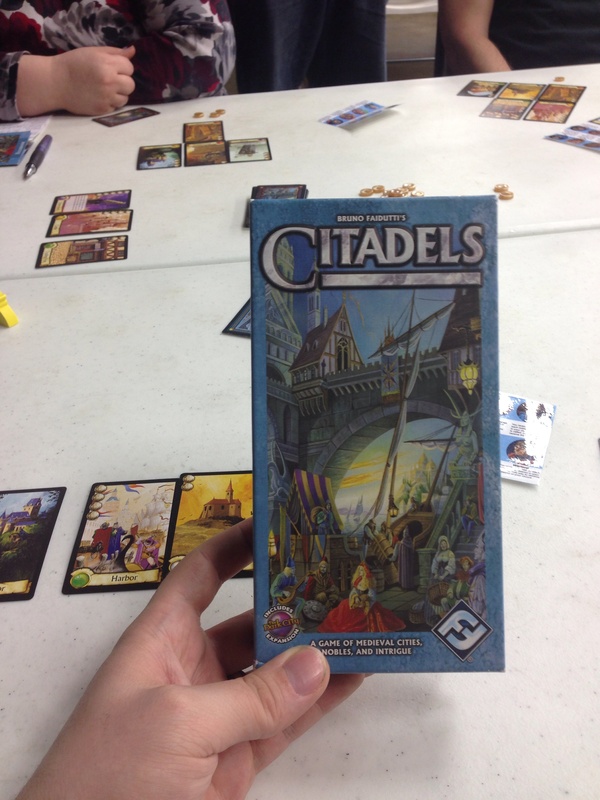 I had a blast playing several games of Citadels. I can honestly say that I have not played a game from Fantasy Flight Games that I didn’t enjoy yet. The mechanics of this game are relatively simple and quite quick to pick up. Where the strategy really comes in is in the selection of roles reach round–trying to pick which roll will best benefit you while avoiding being targeted by other players is where the real mastery of this game lies. Keeping your moves secret while reading the other players and weighing which roles may or may not be used each round is a real art. This games plays well with as few as three and up to eight (although I have only played with 3, 4, and 6 players), is very easy to learn, and plays reasonably quickly, so it’s a great game night game. I most certainly want to add this game to my collection (my birthday is coming up soon, hint hint). I give this game 4.9 out of 5 stars.